Blackhawk Axiom U/L Rifle Stock FREE SHIPPING! The Knoxx Axiom Rifle Stock from Blackhawk is an ultra-lightweight upgrade kit for the Remington 700BDL and HOWA/Weatherby 1500 bolt-action rifles, designed for comfort and accuracy. 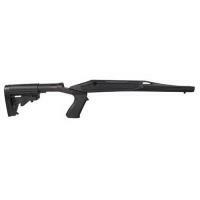 It combines the SpecOps recoil-absorbing stock with a reinforced fiberglass fore-stock. It features a dual recoil suppression system with an innovative pad that reduces the felt impact by up to 80 percent, and its straight cheek weld reduces cheek slap as well as impact against the shoulder. It locks in any one of five different length-of-pull positions to suit different shooters, and its molded pistol grip is sculpted for a comfortable grip. ©2002-2019 CopsPlus.com: Blackhawk Axiom U/L Rifle Stock FREE SHIPPING!